In Roman mythology, Hercules was a hero of remarkable strength and courage renowned for performing amazing feats such as slaying the 9-headed water beast called the Lernaean Hydra, exterminating man-eating birds, and cleaning a mighty big stable in a single day by rerouting two rivers to flush away the filth. Last week while removing a large fruit tree, an observant and lucky insect aficionado happened across several extraordinarily large beetle grubs and a rambunctious pair of Hercules beetles. The Hercules beetle is the largest beetle found in eastern North America. Like its namesake, this beetle is crazy strong. When placed in a terrarium with a tightly fitting lid on my kitchen counter, the male Hercules beetle easily lifted the lid, climbed out, and went for a stroll around my home. Our local Hercules beetle belongs to a family called the Scarabaeidae which includes pests such as the Japanese beetle and other relatives with horns such as rhinoceros beetles. Male rhinoceros beetles in tropical lands have exceptionally long horns used to wage war with other males as they vie for the right to mate. Battles consist of males challenging each other with a series of squeaking sounds. This may be followed by a tussle involving dueling with the horns. The winner usually gets the gal and the loser retreats sometimes with more than his pride wounded. Occasionally, while would-be suitors are occupied in battle, sneaky, noncombatant, interlopers court and win the affections of the lady. Sounds like an episode of a bad soap opera. Larvae use powerful jaws to gnaw decaying wood. In the wild, the main food of adult beetles is the sap of trees and fruit. Beetles create a sap-flow by scraping away tender bark of the tree. In captivity, adult Hercules beetles eat fresh and rotting fruit including apples, oranges, cherries, and bananas. Adult beetles live several months and lay rather large eggs in rotting wood of hollow or fallen trees. Larvae hatch from the eggs and may require 12 to 18 months to complete development, attaining a size of roughly two inches. 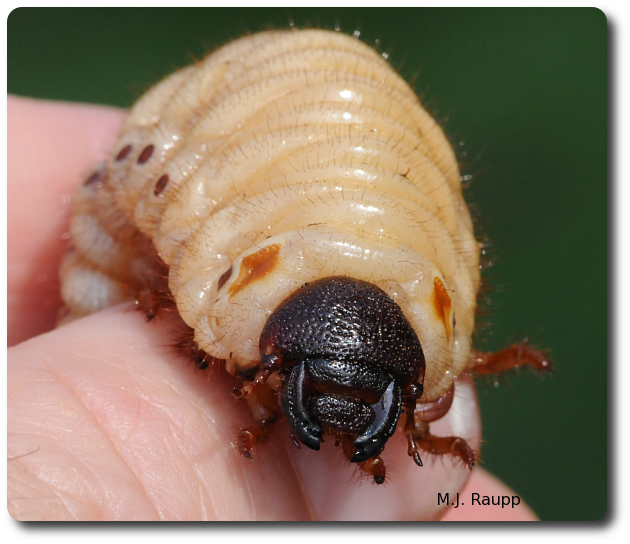 The larvae, called grubs, consume decomposing wood and organic matter, and grow bigger and bigger. Eventually they change to pupae, from which new adults emerge in time. These guys make interesting pets and are fairly easy to rear. Web sites listed below contain instructions for the culture and care of these creatures. Unfortunately, Hercules beetles are attracted to lights and will sometimes appear at porch lamps or in illuminated parking lots where they are eaten by predators or killed by humans. Although these very large beetles appear scary, they are harmless to humans. If you see one or encounter the grubs, enjoy them and return them to the wild unharmed. They are important recyclers of nutrients locked-up in wood and one of Mother Nature’s most fantastic creations.